Discussion in 'Show Me the Bling! (Rings,Earrings,Jewelry)' started by dianabarbara, Mar 4, 2013. I just came back from the UK.. with my dream ring!! After over 8 months of search, multiple trips to Antwerp, Munich, Milano (my city), Berlin (his city), and Amsterdam, innumerable hours on eBay, Diamondbistro, Loupetroop, and Rubylane, and a lot of frustrating moments... we finally have our dream ring!!! for those not interested in the story, jump to the pics! I am incredibly thankful to my soon-to-be fiance, for being so understanding and supportive through this quest, and for taking me everywhere I wanted to go take a look. His attentiveness and dedication move me everyday a bit more, and I am so happy this man will soon be my husband!! About a week ago or so, I found an eBay ad of a stone that I liked and that I found well priced for its size. Those of you that have been following my previous posts know I had my eyes on a 3.96 carats, Q-R color, priced around 20k. I did not love the setting, the price tag was at the very limit, and the stone was certainly very warm, but we were ready to give it a shot. The seller was however very difficult to deal with, for various reasons, and the situation with him got increasingly shady. We were getting really frustrated, and decided not to go through with the purchase (thank God!!!). For a second I thought I would never find what I really wanted, and that I'd better settle with something I liked without enthusiasm. Then my wonderful boyfriend changed the scenario. Last Friday we took a plane to London, and visited probably 15 antique shops or so. Many of these shops are family owned. Some of them even have websites, so sell worldwide. We were pleased with a few of them in terms of customer service and offer. Ullman had the best prices and some of the nicest pieces. However, nothing was catching our attention. All the rings we have seen in the other shops were either 1) nice stone, boring setting, or 2) nice setting, bad stone. None of the sellers was willing to sell them separately or switch stones, which I can understand. So we started thinking to get a ring in the frst category (good stone, so-so setting), separate the stone ourselves, and purchase a reproduction setting we liked somewhere else. None of us was enthusiastic about it, though. The best stone we had found was a 1.3 carats. It looked better and more proportionate to my hand than the three carats and one carats that I tried (perhaps because of their settings?) and it was nicely cut, but it still did not look right on my finger. The ladies who sold it were very kind, but the price was still high for our taste, especially considering we only wanted the stone (around 8000-8500 dollars). We had a wonderful time overall, lovely romantic dinners, and enjoyed the city a lot. But the ring search was not going too well. The next day, Saturday, we started off in the high-end shopping streets, for fun and distraction - I thought. After Harry Winston, Tiffany, and Cartier, I said that I thought we were not going to find anything there. Plus, I was wearing hiking boots (10-12 hours of city hiking per day!!) and started to feel uncomfortable in the high-end environment accessorized like that. But Thomas had something in mind and insisted to proceed. I followed him... and for good. We tried quite several rings in the shop. But when I saw THE ring, I immediately fell in love with it. It immediately felt as that was what we were searching for. I was flooded with joy and excitement. I looked at Thomas. His expression was telling me he felt the same. He took a business card and wrote secretly a big YES! on it, and showed it to me. A few minutes later, it was ours. Our engagement ring!! We asked for a moment alone to ' take a decision' (i.e., to hug each other and cheer together), while he was calling the shop owner to finalize some details. The owner, a very beautiful British lady, walked over to us. She was smiling very politely and kindly, but did not look too pleased. It turns out the price tag was wrong by 7000 pounds (!). Very honorably, she let us get the ring at the lowest quote. GardenLady21, Diamond Girl 21, fioratura and 2 others like this. OMG!!!!! I am so excited and happy for you Diana!!!! Woohooo!!!!! I cannot wait to see more pics! Many congratulations on finding the ring of your dreams from the man of your dreams!!! Wishing you all the happiness in the world!!!!! I keep hitting refresh lol! More pics more pics please!!!! missy!!! sorry, I am trying to cut up some close-ups..
That is the BEST ring story I've read in ages!!! What a serendipitous finding - I'm so glad it all worked out for you and your FI - congratulations on your patience in the hunt for the perfect ring!! Please post more pics - we LIVE for pictures!! Congratulations!! I'm so happy for you both - well deserved!!! Diamond Girl 21, fioratura, LLJsmom and 1 other person like this. LOL believe me Diana I understand! I take worse pics than anyone here probably so do not worry. Take your time! The wait will be well worth it I know and most importantly you and your FI are beyond thrilled with your ER! I am so incredibly happy for you! Awwww, such a great story. MUCH happiness to both of you for a very long happy marriage. That is a great way to kick it off! Love the tulip detail too perfect. How wonderful!!!!! I'm glad you finally have the RING. It's a beauty, and no compromises. another shot from the top. can you tell I was wearing a lot of hand cream? Diamond Girl 21 and LLJsmom like this. Oh I just love happy endings in BLING! Congrats on your ring! What a wonderful ending to your search! The diamond is HUGE and beautiful!! Congratulations!! It is Perfect!!!! Congrats congrats congrats! And what a wonderful and romantic story about how you found it. AND the price tag was wrong and they honored the price! Awesome! Fantastic story. Fabulous ring. Hearty congratulations to you and your fiance. When I am Amsterdam in July I will be thinking about you and your beautiful ring. That is such a cool design!!! I really love all the detailing on that, and the diamond looks superb. Congrats on your engagement! What a romantic story! Your ring is very beautiful! enjoy! Aww, what a lovely story and a truly GORGEOUS ring! Your Thomas sounds like a great guy. Congrats on finding your dream ring, it's stunning! I love when a ring is just meant to be. Congratulations, DianaBarbara, it is absolutely gorgeous. Wear it in health and happiness. Congratulations on your engagement, and on finding your amazing ring at well under your budget!! I love the mounting, and hope you post many, many more pictures! "Experience is something you don't get until just after you needed it." Yayyyyyyyy!!! I'm sooo glad you have your ring!!!!! It is beautiful! And totally meant to be! Omg! Too perfect about the tulips!! Love it. Such a sweet story and more pics!!!! It looks very nice from what I see. Glad that everything was so serendipitous!! CONGRATULATIONS! That was a find well worth waiting for - I love it when things come together like that. The cut looks superb, and that setting - exquisite! I hope you will post many macro shots. 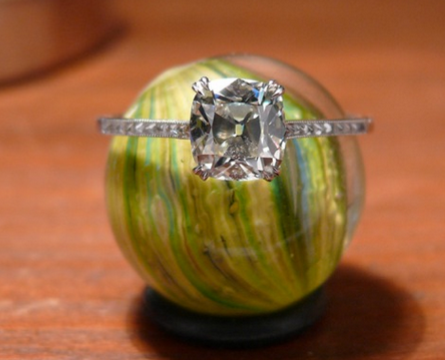 Do you know what the specs on the stone are, or will that wait for an evaluation? It looks delightfully white for an older stone! LibbyLA, natyLad, Sarahbear, lin_ny, Efriede, and Alistra, thank you for your kind words! Gemfever, thanks for your sweet comment and for all your support when I was searching desperately for something I'd like. Go girl!!!! Matata, thanks for your congrats!! If you'd like some advice on where to go in the Netherlands or would like to meet for a coffee, just let me know!! I am so happy for you! Congratulations! What a beautiful, touching story and what a beautiful ring. Love the happy ending to your seach for the perfect ring. Circe, we Europeans are crazy people!! Only ONE of the antique shops we visited carried ONE ring with a certification. In that case was a GIA cert. All the others, nothing. The most extreme case was Berganza, where they refuse to give basic information regarding carat weight, color, and clarity- even just a range indication. They only state price and approx year of manufacturing. Other sales assistants and shop owners we spoke with even seemed bugged by technical question. The stone IS white! Certainly not a D or an E, but it is among the whitest OECs we have seen in person. The other contender I was referring in the first thread had a very very strong blue fluorescence It looked so blue in the window that my boyfriend thought it was an aquamarine!! The cut was also very very nice, but it was not yet the right size for my taste (1.3). The ladies at the shop had no clue it was blue because of the fluo, so it was nice to be helpful for once!! (I love all I've learned on PS, it's such a great place!!). I can't wait for the ring to be here and to experiment with the pics! It's coming sometimes at the end of the week and we are very very excited! And oh, I have no idea of how to take a macro. Maybe I need to take the pics through the loupe? You have been a really good friend in this journey. Can we still meet up for a coffee, the next time I pop in NYC? YT and almondblossom, thank you your comments are so sweet!! this community is really made of awesome people!! I wish a lot of happiness to you too!! I am also in Europe and haven't found an OEC with certificate either (although they have been graded by the seller). It is inspiring that you were able to find such a lovely OEC in Europe. I can't wait to see macro shots! The pattern looks really lovely and the setting is so pretty and unique! !